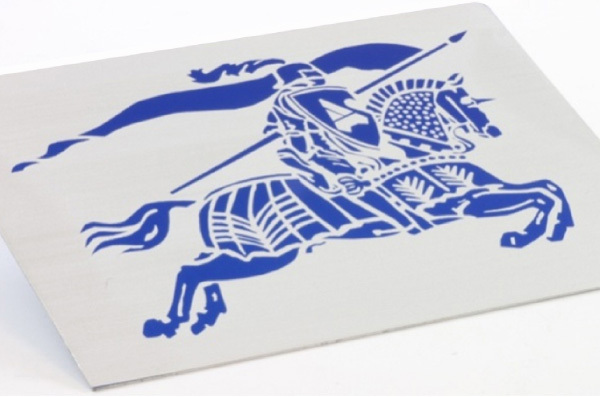 Anodised aluminium represents a major application space for Fiber Laser marking. The various commercially available anodised finishes mean that there are a range of different mark effects that can be achieved. Conventional marking relies on an engraving technique where the anodised layer is removed to reveal to aluminium base material. However, with ours Pulsetune Waveforms, offered on redENERGY HS series Lasers, a range of different marking effects can be achieved from colour bleaching to dark marking. Our redENERGY G4 pulsed Fiber Laser is designed for marking and pulsed micro-machining, offering users speed and flexibility. The range includes three optically engineered beam qualities which are tailored for specific applications, including engraving, drilling, marking and precision cutting. The G4 gives the user a low cost of ownership, high quality Laser source solution. The design focuses on enhancing the ease of OEM integration, making it a truly ‘plug and play’ product. Furthermore the Laser comes with an industry leading standard warranty of 3 years. Anodised parts can exhibit improved wear and corrosion properties, as well as being more decorative due to the wide range of colours that can be supplied through the application of selected dyes. These layers are relatively thin in the 5-100µm range and the manufacturing conditions can greatly affect the properties of these layers. Coloured parts are commonly used from decorative applications in a wide range of consumer goods and marking of these parts is generally achieved though the removal of the coloured anodised layer to reveal the base aluminium material, either a white or silvery mark depending on process conditions. These layers are simple to process with Fiber Lasers as they need relatively little energy density to remove the coloured material. Commonly used in giftware and consumer goods, alphanumeric and marketing logos are typically marked. Good crisp clear marks require a moderate level of overlap of the pulses to ensure that there is no residual coloured material. To achieve high speed marking high repetition rates are required as at speeds of circa 3m/s requires pulse frequencies >100kHz to ensure good spot overlaps. Operating at higher repetition rates it is important to ensure that there is still sufficient peak power to give clear material removal. Lasers with fixed pulse durations such as q-switched Lasers have limited processing capabilities at higher frequencies due to limited peak power. However, With our directly modulated seed technology and Pulsetune waveforms high peak powers can be maintained by shortening the pulse duration thereby maintaining their effectiveness at higher repetition rates and processing speeds. Figure 2. Simple engrave type marking of anodised giftware using 20W redENERGY RM series Laser. Figure 3. Image shows how using our Waveforms and rep rate can give improved marking at high speeds. Using short duration pulses at 500kHz processing speeds of 5m/s can give clean clear high contrast “much whiter” marks. At lower frequencies the marks tend to be a silver grey as a result of higher surface roughness resulting from the longer duration pulses. Removal of anodisation at high kHz with WF0 is not possible because although there may be sufficient pulse energy there is insufficient peak power to initiate the removal process. Using ours Pulsetune waveforms the pulse durations are effectively reduced which increases peak power and hence energy density on the material enabling processing to continue at higher kHz. 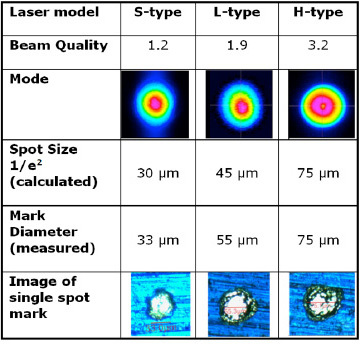 We also offer Lasers with a range of beam qualities; a single moded S-type with M2<1.3 a Low moded L-type with M2 <2 and a higher moded H- type M2 <3.6. For large area removal applications the H-type 40W Laser can give the highest area removal due to the broader energy distribution and larger spot size allowing greater line spacing to be used. For fine lines and features the S-series can give line widths <30µm. Some anodised layers can be processed by selectively removing the dyes from the anodised layers, effectively bleaching them while leaving the anodised material intact. Examples of black anodised material can be processed to reveal a bright white high contrast mark. Careful pulse parameter selection is required to ensure that the layer is bleached but with no removal of the oxide. Typically short duration pulses are required with high peak powers and low pulse energy. Many parts are increasingly supplied with a simple clear anodised layer and this can pose a problem in getting good contrast for marking. Conventional engraving technique whereby the anodised layer is removed, reveals a white or silvery grey aluminium base material that can be difficult to see. By careful pulse parameter selection using our waveforms and processing conditions, a range of dark marks can be made with significantly increased contrast. Figure 7. Comparison of Dark mark made with 20W redENERGY HS on curved clear anodised component 44mmØ with standard engrave type mark made with 20W redENERGY RM laser. The surface of these dark marks can be from smooth to lightly textured to give a “leatherette” finish that is different to a standard engraved mark. These marks are highly dependent of the aluminium grades and the types of anodised coating used and optimised process conditions need to be identified. Once the conditions are identified they are highly repeatable and production ready. This marking regime can also be used to create a range of marks from white through grey tones to black. Figure 8. Showing the range of contrast options of dark marking of clear anodised materials using our redENERGY HS lasers. 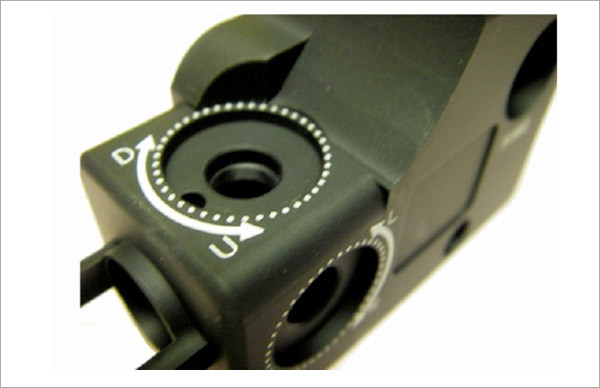 The use of our waveforms can provide significantly more marking options for anodised aluminium parts. For increased processing speeds our higher pulse frequencies available with the redENERGY HS series Lasers allow marking at >3m/s utilising the capabilities of today’s high speed scanners. For colour marking the 40W Laser can maximise productivity. While for higher contrast type marks the mix of our pulse waveforms and high repetition rates can go from white to black on clear anodised materials. Whatever your requirement for marking anodised aluminium we have the right Fiber Laser source to make it possible. Speak to your sales representative or contact us directly to see how we can help you.